A 480-foot high turbine came down in a storm - only the second windmill in Scotland to crash to the ground. The astonishing structural failure of the £2 million machine has prompted demands for information by the community in Barrhill. The Kilgallioch wind farm is operated by Scottish Power Renewables which had failed to alert the public to the incident for SEVEN DAYS. Luckily nobody was near the 160-ton turbine at the time it fell. The Ayrshire Post's source says the 328-foot tower “creased” at the access door at ground level. The three blades and switchgear were all smashed on impact. “Debris was spread over half a kilometre and a crane was been brought in to try and clear the damage. “The company was trying to keep things hush-hush and were not keen to say anything. “The site is so large and unseen from public roads that the only way to see the collapse is from the air. At the time 55mph gusts were blowing in from the north west. The following Friday the company released a basic statement admitting it had happened. The tower which fell was still to generate any electricity for the grid. It will be one of the largest onshore farms in the UK. Spanish firm Gamesa and Scottish Power are carrying out a joint investigation. The site is peaty moorland spread over 12 square miles. One Glasgow-based national energy expert said: “A collapse like this is extremely rare. “The whole industry will be keen to know where this steel came from and who fabricated the tower. We haven't yet posted anything about the turbine suicide at the Kilgallioch wind farm, on the border between Dumfries & Galloway and South Ayrshire, although it's been widely reported and commented on - a whole turbine collapse, not just one which had hurled a component or two to the four winds. We've been gobsmacked today to read the Record account of it. Not true. That's why we've put up the relevant data from Caithness Wind Information Forum's accident statistics which CWIF kindly pulled out. It must be stressed that these are only incidents which have been reported and confirmed. In one instance, CWIF is awaiting confirmation two years on. The report is sloppy anyway. Someone want to e mail the Record and put Stephen Houston, the reporter, in the picture as to just how many collapses there have been - and in how many countries. Direct him to the CWIF website. Information is being given to the public and should be 100% accurate. It's not, and that misinformation is compounded by the likes of the unnamed Glasgow expert and the Scottish Renewables mouthpiece - Senior Policy Manager Lindsay Roberts - who said: “Onshore wind turbines are well-proven and reliable, and incidents are extremely rare. Onshore in Scotland? Onshore in the UK? Onshore in the world, presumably as it's an unqualified statement. So, more lies. Incidents are becoming commonplace, either whole liberation, component liberation or self-immolation. “It is important to note that in this case the turbine involved was not yet generating electricity for the grid and is part of a wind farm which is under construction." Quite what that has to do with anything we really don't know except for purposes of spin. Well it may have been reported to all the statutory authorities immediately it happened - that we're not privy to. But it took one whole week before Scottish Power deigned to inform the public. Although by that time some of the public was already very well informed hence the tipping off of the media. So why not go public with it, Scottish Power? Did you hope to keep it hushed up? And why not let us see photos in the interest of...transparency? Dear Sirs, I have read with dismay your story about the turbine collapse at the new Kilgallioch wind farm in South Ayrshire . 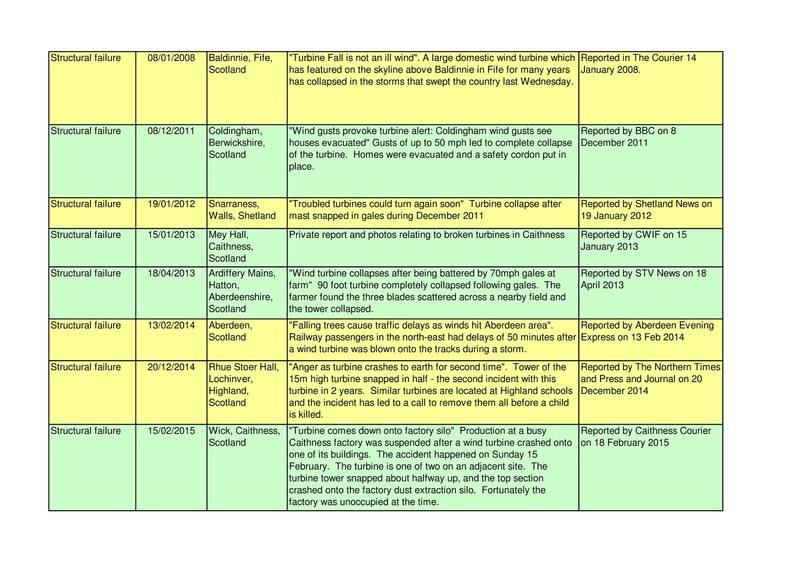 You state that "A 480-foot high turbine came down in a storm, only the second windmill in Scotland to crash to the ground" I wonder where you get this information from as there is no requirement to report publicly all turbine incidents. A friend informs me that she is still awaiting an HSE report on a Wick turbine which fell two years ago despite repeated chasing. "Safety fears after faults found in toppled turbines" Report of HSE investigation into two West Country turbine collapses in 2013 has found poor design, use of inferior materials and a systematic failure to install the turbines properly. Initial reports suggested high winds may have been responsible for the failures but restricted reports by the Healthy and Safety Executive (HSE), obtained under the Freedom of Information Act (FoI), have blamed the way the towers were secured. Specialist inspector Darren Nash concluded that the first generation model of the turbine sited in Cornwall appeared “susceptible to fatigue failure” and said Gaia Wind had found “ten further units with existing defects” out of the company’s 70 or 80 turbines. Endurance Wind Power, makers of the E3120 turbine which fell in Devon, identified a further 29 turbines that might have been affected by a problem with the foundations"
This of course was not in Scotland but suggest there is a bigger problem with turbines than has been reported by the manufacturers. I am sure you will realise that there is potential danger to life if such large structures have a potential to fall to the ground, not to mention the fires that have occurred in turbines. Indeed I believe that there have been 2 such fires at Kilgallioch in recent months. 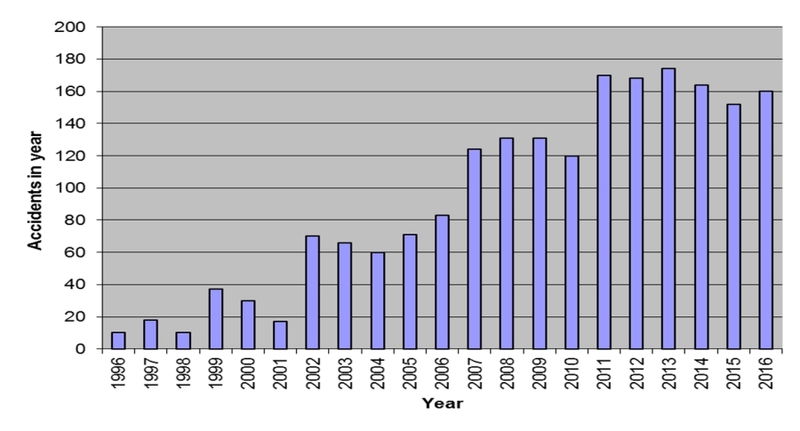 These accident statistics are copyrightThese accident statistics are copyrightCaithness Windfarm Information Forum 2017. The data may be used or referred to by groups or individuals, provided that the source (Caithness Windfarm Information Forum) is acknowledged and our URL www.caithnesswindfarms.co.uk quoted at the same time. Caithness Windfarm Information Forum is not responsible for the accuracy of Third Party material or references.. The data may be used or referred to by groups or individuals, provided that the source (Caithness Windfarm Information Forum) is acknowledged and our URL www.caithnesswindfarms.co.uk quoted at the same time. Caithness Windfarm Information Forum is not responsible for the accuracy of Third Party material or references.